We've made our first (small) passage. We spent four nights anchored just inside the mouth of the Burnett River. Although the forecast was marginal - S/SE up to 20/25 knots, seas 1.7m to 2.2m - at our limit for a north bound passage, we saw ourselves being there several more days before the weather settled. So we set off for Lady Musgrave Island, 50 miles due north. There were times when we regretted the decision - we saw winds of 25/30 and the 2.2m seas, but at least they were generally aft of the beam - but we got here. After arrival the wind and seas continued and we had a pretty choppy evening inside the atoll. We visited Lady Musgrave twice last year. It's an atoll with an island at the south end. A good anchorage except that big seas will come over the reef at high tide. A tourist boat comes daily bringing snorkellers and island visitors. We'll stay here a few days until the weather quiets a bit. We left Midtown Marina on Saturday and motored down the Burnett River to the port. We fueled at Bundaberg Port Marina, anchored nearby, and here we stay. The weather is pretty poor - it’s raining hard right now - so we’ll stay here until it improves. We’ve travelled about 7 miles! We’re back in the marina. The minor problem in the port keel has been fixed, and we’ll be ready to leave shortly. We now plan to head up the Queensland coast and then clear out at, probably, Cairns to head to Papua New Guinea. We’re on the hard again. Shortly after we went back into the water, we found that water was getting into the holding tank in the port keel. There seems to be a hole or crack on the underside of the keel. Right now, the guys here are trying to figure how to jack the boat up to get access to the underside of the keel - ‘cos she’s standing on her keels! Hopefully, we’ll be back in the water by the end of the week. Our todo list is getting shorter, and the Landcruiser has been sold, so we may be ready to leave pretty soon. 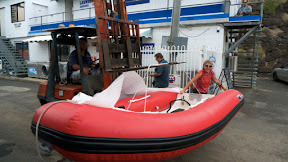 Our dinghy is back from Brisbane. Same old fiberglass hull but beautiful new red tubes. 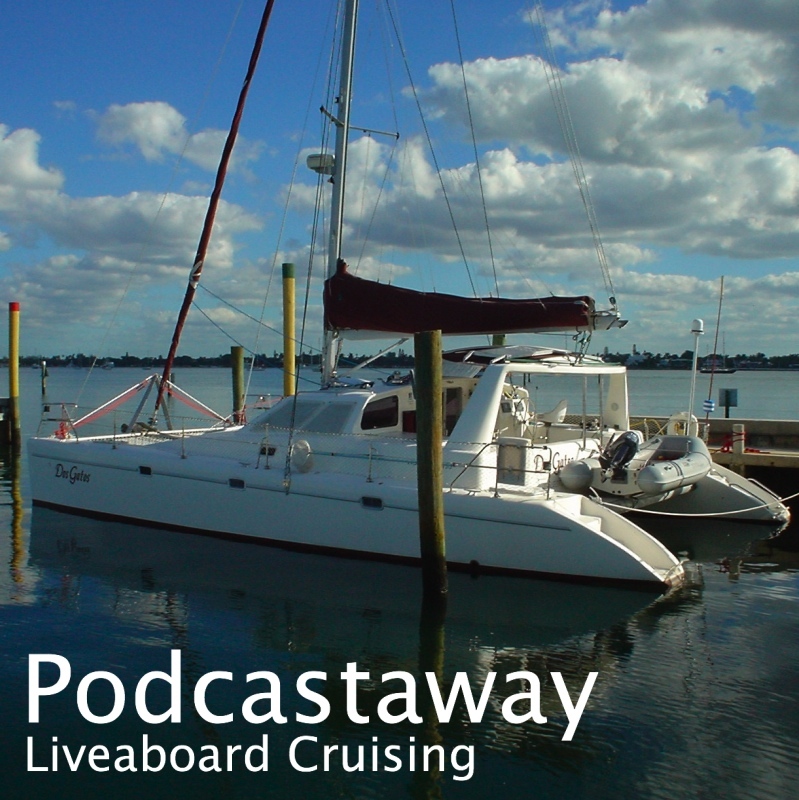 We had it re-tubed for AU$3,200 compared with at least $5,000 for a new dinghy. Also, we’re used to this one having used it for 10 years; and we’re happy with it. It was shipped to the marina where we cleaned and painted the underside. Then they helped us get it into the water, using their forklift.